Tony Blair today joined condemnation of Jeremy Corbyn for refusing to hold Brexit talks with the PM. Mr Blair said it was wrong for the Opposition leader to snub a meeting with the premier at a ‘moment of national crisis’. 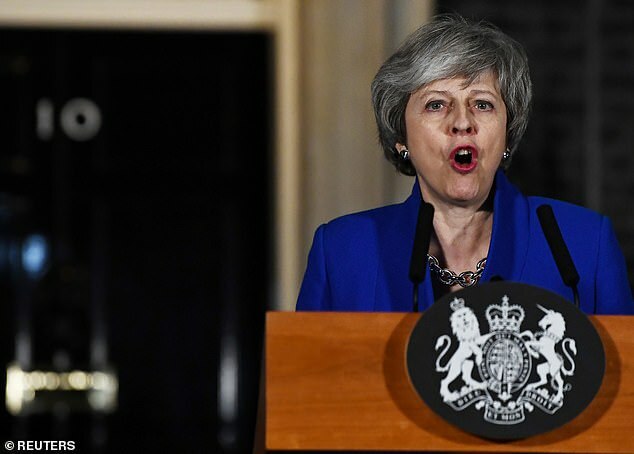 Theresa May held out an olive branch to political rivals last night after surviving a Labour bid to oust her, urging them to come to the table and help break the Parliamentary deadlock. Allies of the Labour leader gloated today that his tactics mean Mrs May will have to split the Tory party if she wants to get a Brexit package through the Commons. However, Tory and Opposition MPs pointed out that Mr Corbyn was willing to ‘sit down with terrorists’ without any preconditions – insisting his only aim was to seize power whatever the consequences for the country. Mr Corbyn – who underline his intentions by delivering a Brexit speech in the marginal constituency of Hastings this morning – saw his latest bid to force an election spectacularly backfire in the Commons last night. A no-confidence motion tabled by Labour was defeated by 325 votes to 306 – with the victory margin of 19 significantly larger than Mrs May’s effective majority of 13. Mrs May’s position was secured by the DUP and Tory Brexiteers coming back into the fold despite dealing her a vicious humiliation by defeating her EU deal the night before. Labour former PM Mr Blair accused Mr Corbyn of deliberately avoiding engagement on Brexit. ‘If, in a moment of national crisis, the Prime Minister asks the Leader of the Opposition to come and talk, of course he should,’ he told BBC Radio 4’s Today programme. The former prime minister and Labour leader, who backs a second referendum, said Mr Corbyn needed to clarify his stance. Mr Blair, who said he believed an extension the Article 50 withdrawal process was now almost ‘inevitable’, also criticised Mrs May’s consultation. ‘When I hear her sometimes talk about consultation, the next moment she lays down a load of red lines that makes that consultation pretty nugatory,’ he said. MPs lashed the Labour leader – accusing him of sitting down with terrorists but rebuffing the leader of the United Kingdom at a time of national crisis. In 1984, Corbyn invited Linda Quigley and Gerard McLoughlin for tea in Parliament – both were convicted of IRA terrorism. Labour MP Mike Gapes, who backs a second referendum, underlined the depth of splits in Mr Corbyn’s own ranks by lambasting him today. ‘Apparently Corbyn is prepared to hold talks with Hamas, Hezbollah, Assad and Iran without preconditions. But not with the UK Prime Minister. Why?’ he tweeted. Tory MP James Heappey retorted: ‘Jeremy Corbyn has sat down with terrorists around the world apparently in pursuit of and always without preconditions. Shadow international trade secretary Barry Gardiner boasted that Mrs May would have to risk splitting the Conservative Party to break the parliamentary deadlock. ‘If she wants to negotiate with all parties in Parliament, and if she wants to do that in good faith, she has to say ‘ok, I’m not sticking to every single one of the red lines that I’ve established’,’ he told ITV’s Good Morning Britain. ‘We are saying let’s do this in the best interests of the British people, in the way that every industry, every trade union, every manufacturing association – and even some people in her own Cabinet – are saying is the sensible way forward.